For auto commuters, an essential oils car diffuser (B, $10.99, www.auracacia.com) helps keep the calm with relaxing lavender scents. A portable XM radio will give drivers plenty to listen to while stuck in traffic. Shown here: The Xpress RC Radio (E, $169.99, www.xmradio.com/xpressrc). The TomTom GO720 (C, $499.95, www.tomtom.com) is the perfect GPS device for those who travel. It holds maps of North America, Europe and Asia so no matter where business calls, travelers armed with this navigation device won’t get lost. Those commuting by public transit can keep their fare-card pass handy and protected from damage in an artistic plastic case featuring one of the many design options offered on the TranSleev Web site (H, $3.50, www.transleev.com). Tune out other commuters and travel in peace with a pair of SoundShield 550 noise-cancellation headphones (F, $200, www.brookstone.com) from Brookstone. The Jawbone, a new adaptive Bluetooth headset (I, $119.99, www.jawbone.com) for mobile phones, is a fantastic gift for anyone who wants to hear their mobile phone calls better — at home or on the road. The noise canceling technology eliminates all background noise and far exceeds the sound quality of any other headset. This stylish and comfortable device matches the outline of your face and comes in three colors. Hold all kinds of stuff, including a bag lunch and an extra pair of shoes, in these great commuter bags. Coach’s large Ergo belted leather tote (G, $498, www.coach.com) and Cole Haan’s large convertible Aerin Collection tote (D, $450, www.colehaan.com)both make stylish and professional bags that will definitely store it all. Acme Made’s Clyde bag (A, $180, www.acmemade.com), great for men and women, safely holds a laptop and plenty more with pockets for lots of gadgets. The stylish, comfortable, waterproof and highly-functional messenger bag is perfect for weekends and the office. Article published in The San Fransisco Chronicle’s “Holiday Gift Guide” custom publication on December 5, 2007. 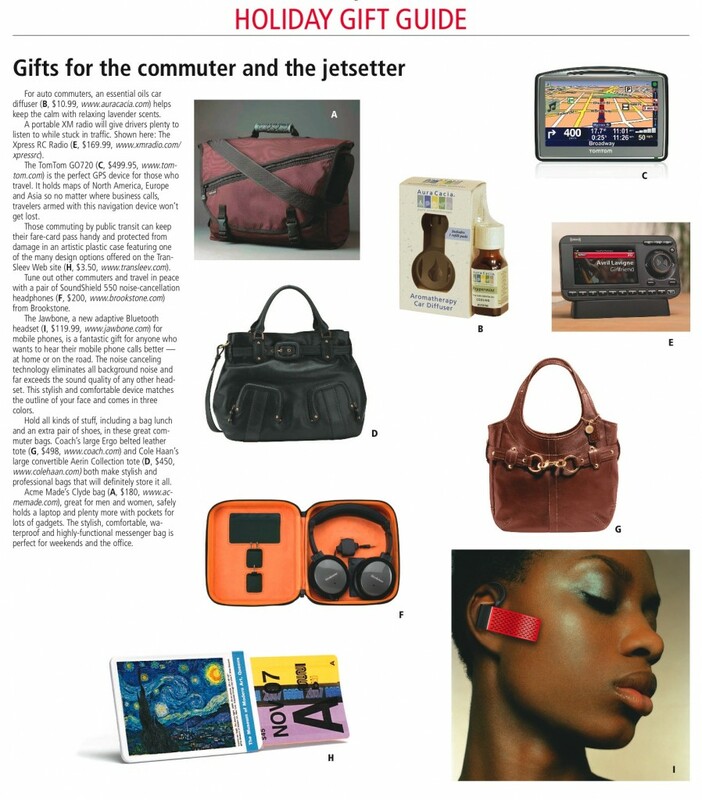 Download PDF of original article “Gifts for the commuter and the jetsetter” to view full layout with PHOTOS!